Artificial grass has long been used for covering sports fields and commercial spaces, but it is also a great option when enhancing residential yards. Modern landscaping designs now include artificial grass, as it looks and feels natural and stays that way for a long time without regular maintenance. Gone are the days when you have to regularly mow, edge, and trim your grass just to keep your garden looking good. There will be no need to familiarize yourself with confusing fertilizer instructions. You can also kiss the brownish spots that usually riddle natural grass goodbye. You will never worry about toxic chemicals poisoning your land and affecting the health of your children and pets anymore. Whether the grass is exposed to the hot summer sun or freezing winter snow, it will always look beautiful. Following are several reasons why artificial grass in Las Vegas is an excellent choice for a landscaping solution. Landscaping with artificial grass saves money in many ways. It is low maintenance, which means you will need to spend less on professional garden maintenance. In the fall, if you have trees that shed leaves, you don’t have to worry that the fallen leaves might block the sunlight that keeps your lawn green. You can leave the debris for days and sweep them away anytime, as they won’t affect the artificial lawn’s appearance. When it comes to water use, artificial grass performs better than real grass. You still need to water it from time to time to wash away dirt and debris that are building within the piles but not as much water as natural grass needs to stay healthy. 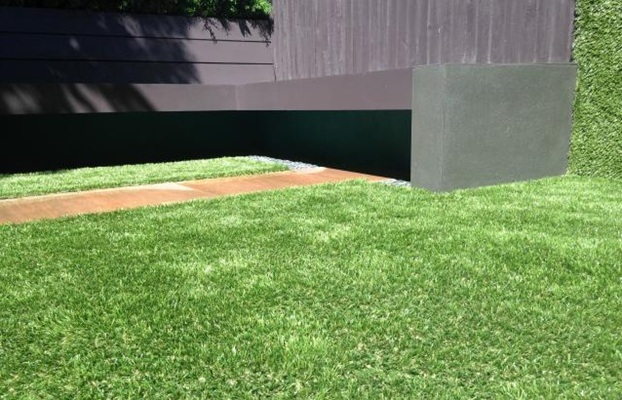 While real grass requires the use of a lawn mower to keep it flat and neat, artificial grass doesn’t need one to maintain a desirable height. Artificial grass may last up to 25 years without growing, so imagine how much savings you can make out of it. With real grass, you will need to be careful about foot traffic and placing furniture on your lawn, because it can kill the grass in the area. While artificial grass can bend over and shrink when you put a heavy object on it, it won’t wither, rot, and expose the underlying layers. Even landscape artists who would never think of artificial products in a garden are starting to recommend artificial grass. It has improved a lot over the years and the design, texture, and colors are completely natural-looking. The best part is it looks beautiful all the time. Natural grass, on the other hand, has a dormant stage and turns brown during winter. Your yard looks unattractive for a good part of the year and it takes plenty of water and fertilizer to bring it back to a beautiful green color for the summer. Conserving water is an important part of everyday life, and you don’t need it in Las Vegas for your artificial grass to look fresh and green year round. With artificial grass in Las Vegas, you can reduce your carbon footprint. It is more eco-friendly than natural grass for some of the same reasons mentioned above. Toxic fertilizer, excessive water usage, and gas or electric powered lawn mowers are never needed. Toxic fertilizers are not only unhealthy for children and pets that play on the lawn, but they also combine with runoff and contaminate groundwater and river systems. The base of artificial grass is made mostly of recycled materials, which would normally end up in landfills. After years of use, you may want to replace your artificial grass. The process of replacing it is cheaper than planting new grass from seeds or sod. The old artificial grass is still useful for garden paths or dog runs, making it an even more cost-effective landscaping option. If you or your parents can no longer mow or maintain the lawn, artificial grass is the answer. It is also a great option for a vacation home which you don’t regularly visit and maintain. Even after months of being away, you can expect your artificial lawn to stay in great shape. When you’re back, all you have to do is to sweep or wash it to restore its green look. Artificial grass is also very easy to clean. You can remove pet poop and mud simply by scooping and scrubbing. Meanwhile, with real grass, pet poop and urine may have adverse effects on the grass even after you clean them away. It is a great landscaping around your swimming pool. It keeps the pool clean, as it prevents dust and dirt from getting carried into the water. Patios and roof gardens take on a completely new atmosphere when there is artificial grass. You can make a small area seem larger and more inviting by installing artificial grass on strategic areas. If you have children who are used to playing on the lawn for hours, you may have worn patches that become mud pits. Artificial grass is the answer. It is 100 percent permeable due to its drainage technology and rinses the area clean very fast. This is why it is also great for kennels. With all of these benefits and virtually no downside, artificial grass is a great option if you are looking to upgrade your property and increase the value of your home. You will enjoy years of hassle-free maintenance with your beautiful, evergreen lawn. Just make sure it is provided and installed by a reputable artificial turf installation company like Las Vegas Artificial Grass Pros to enjoy its full potential.